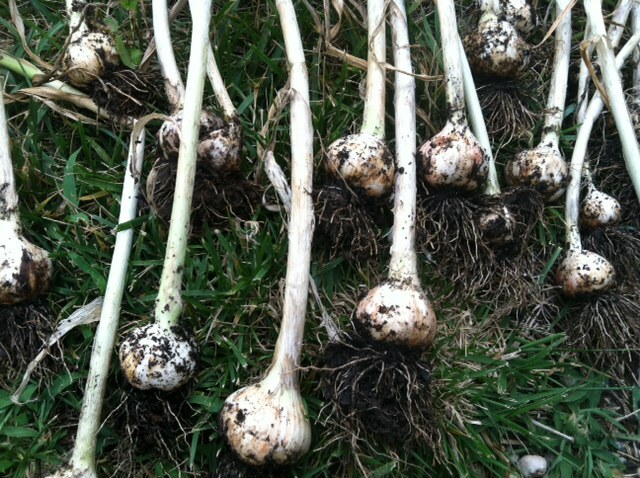 Step 1: This fall, purchase a head of your favorite garlic, or get one from a local farm. I used a head of organic garlic from my local grocery store. Peel the outermost layers and hit it with the heel of your hand until the cloves come apart. (Even better: watch this short video for an amazing tip you will use from here on in.) 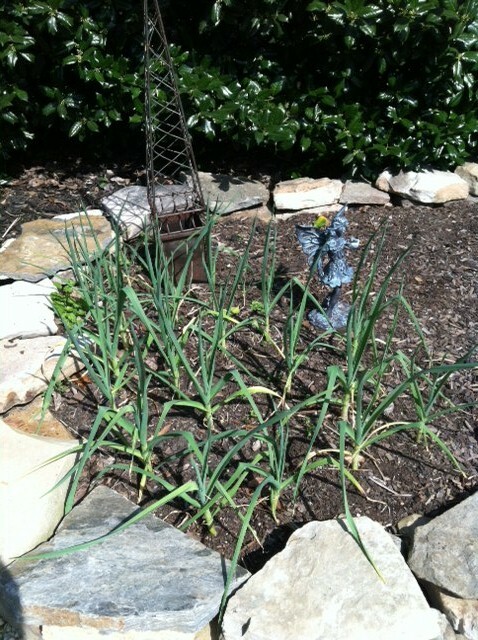 I planted my garlic in September. 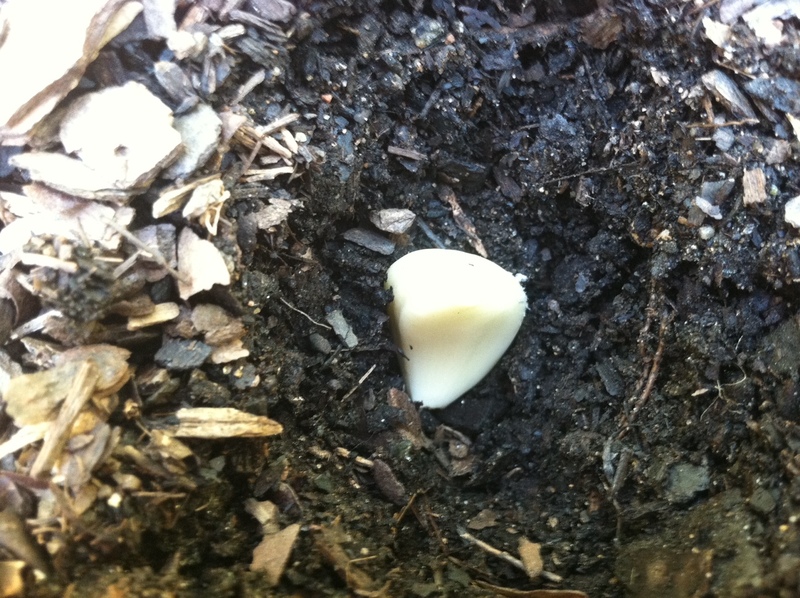 Step 2: Choose a spot in your garden to plant your garlic. 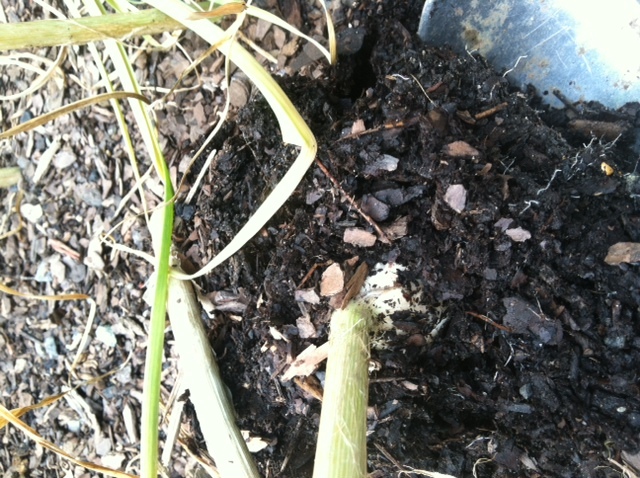 One by one, push each clove into the soil about an inch deep, with the point of the clove facing upward. Leave about 3 inches in between each clove you plant. Once your garlic looks like it’s had too much tequila, you’re in business. Remember, your garlic is hungover so be gentle!! You can see that this one looked ready, which means they probably all were about done and it’s okay to begin to get them out of the ground. No matter how tempting it is, do NOT pull them out. Instead, using a shovel, get underneath the garlic head and lift it out from below. 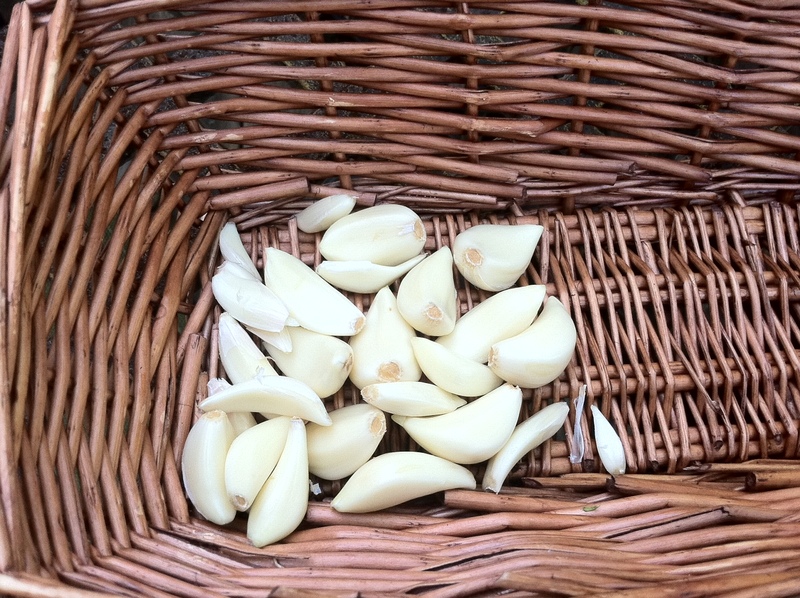 BE CAREFUL not to scrape the head of garlic or touch it with the shovel – it will bruise the garlic. Once you start lifting them out of the ground make sure you do not put them in direct sunlight – they are vulnerable little things and will burn in the sun. Very carefully shake off any excess dirt (and worms), and place them in the shade. You can see that they are all different sizes – some are nice and big and resemble what you buy in the grocery store, and others are a bit smaller, but they are all FRESH and HOME GROWN! Step 5: Place the garlic as-is in a bowl in a dark, dry place where it will stay for 3-4 weeks until dry or “cured” (sunlight can change the flavor of garlic.) Once dried, you can cut off the tops (stems) and roots. To store your garlic, keep it in a cool dark place. You can store it in a dish, or a mesh bag. If you’re anything like me you’ll go through them faster than you can store them anyway! Be sure to set a bulb or two aside for next year so you can do it all over again. For my simple “Ooooh La La Garlic Bread” recipe and a “how-to” on roasting a head of garlic, click here. Hi Alessandra! It’s funny you’re talking about garlic because my husband has been growing it for a couple of years now and we LOVE it! I learned that you can make a pesto with the scapes – the curly top that leads to the seeds. I GOOGLED for a recipe and found several. I’ll be trying it this week! Hi Lori! Ooo that sounds so good! Can you send me the recipe after you try it?? 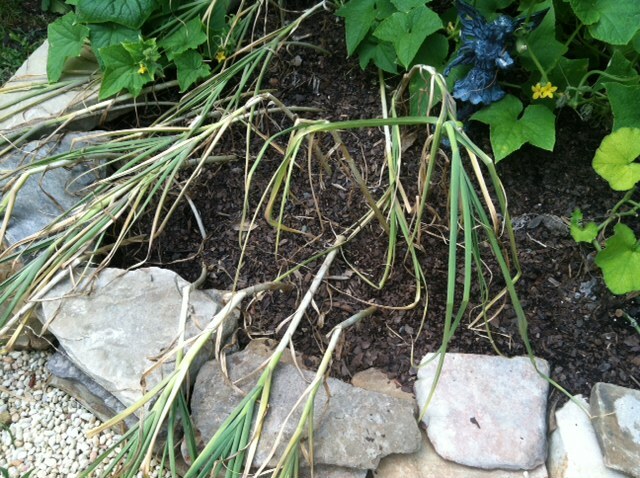 I was wondering about the scapes! I know some people put them in salads but we didn’t try anything with them. 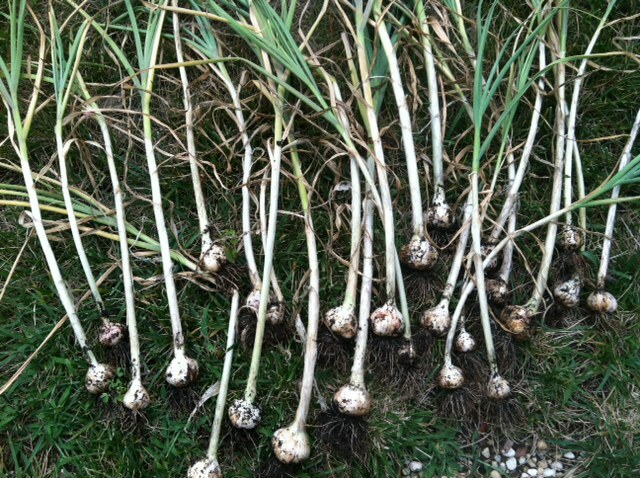 Do you use the same garlic every year to re-plant? I never heard of using them in salads! I’d think they’d be strong! I’ll send you the recipe once I’ve tried it. It seems there are many optional ingredients – from pine nuts to almonds to walnuts. I have cashews and almonds and some pecans so I’m doing a mix! My husband is a seed-saver. 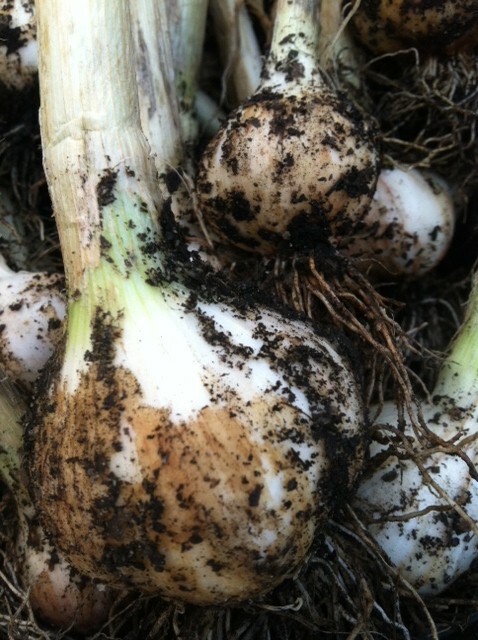 He started with a huge clove of garlic from a farm that his brother gave him and has saved the cloves ever since! 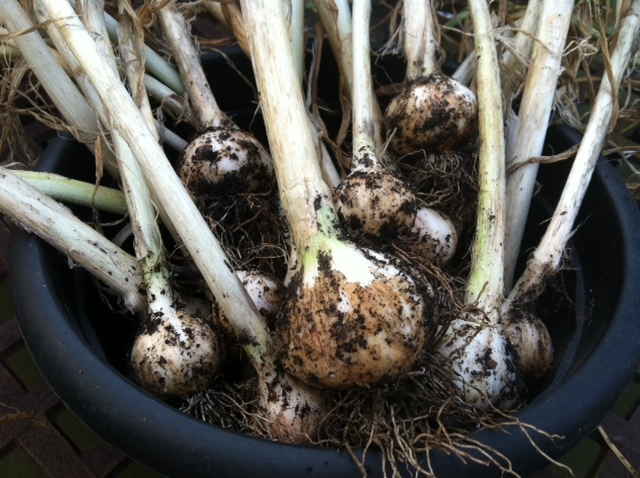 I’m SO excited that you grew garlic all on your own and got such wonderful results! You know that when it comes to garlic we Mediterranean Girls well…as you said, we go through them like there was no tomorrow. I am SO planning on planting them this September after reading this. Can’t wait, thanks! Hi Pearl, it is so easy I still can’t believe it. I planted another batch a couple of weeks ago to harvest in the summer again – fingers crossed it does just as well. I still have plenty of garlic heads left! Good luck with yours! Meatless Recipe For Meat-Eaters: Greek Tempeh!